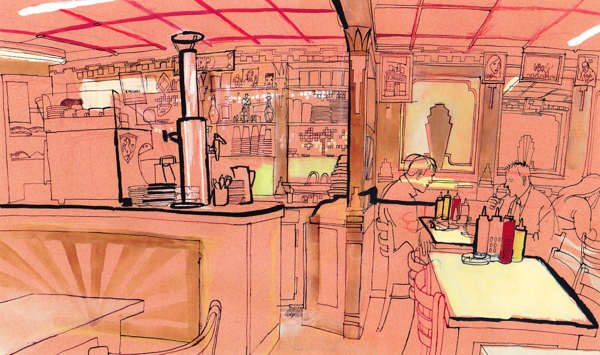 This is Lucinda Rogers‘ drawing of E.Pellicci in the Bethnal Green Rd, London’s most celebrated family-run cafe, into the third generation now and in business for over a century – and continuing to welcome East Enders who have been coming for generations to sit in the cosy marquetry-lined interior and enjoy the honest, keenly-priced meals prepared every day from fresh ingredients. 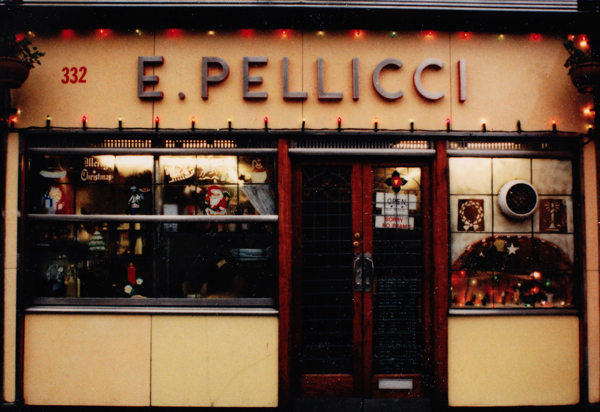 E.Pellicci is a marvel. It is so beautiful it is listed, the food is always exemplary and I every time I come here I leave heartened to have met someone new. I found Lucinda Rogers’ drawing on the wall in one of the small upper rooms that now serves as an informal museum of the history of the cafe, curated by Maria Pellicci’s nephew – Toni, a bright-eyed Neapolitan, who has been working here since he left school in Lucca in Tuscany and came to London in 1970. 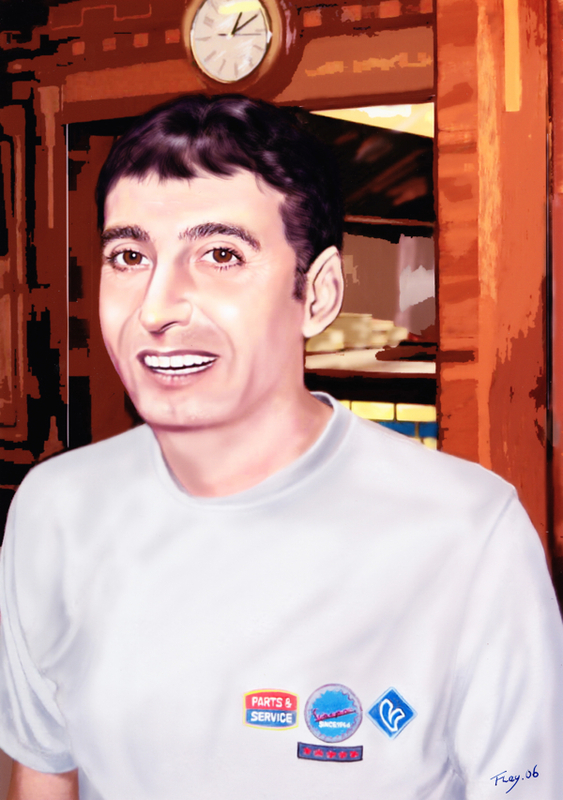 He led me up the narrow staircase, opened the door of the low-ceilinged room and with a single shy gesture of his arm indicated the family museum. 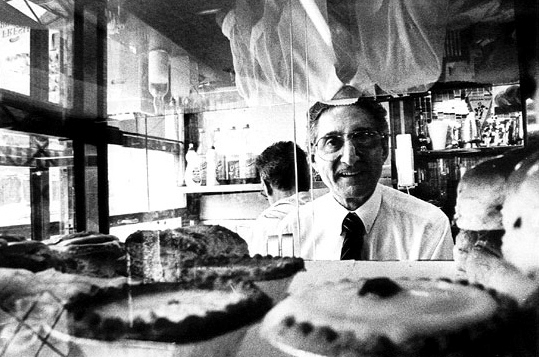 Toni has lined the walls with press cuttings, photographs and all kinds of memorabilia, which tell the story of the ascendancy of Pellicci’s, attended by a few statues of saints to give the pleasing aura of a shrine to this cherished collection. 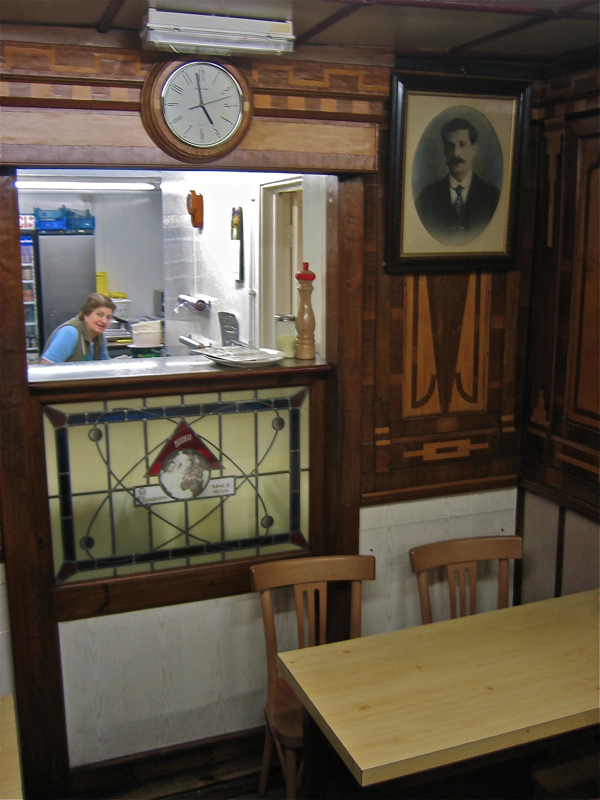 Primo Pellici began working in the cafe in 1900 and it was here in these two rooms that his wife Elide brought up his seven children single-handedly, whilst running the cafe below to keep the family after her husband’s death in 1931. 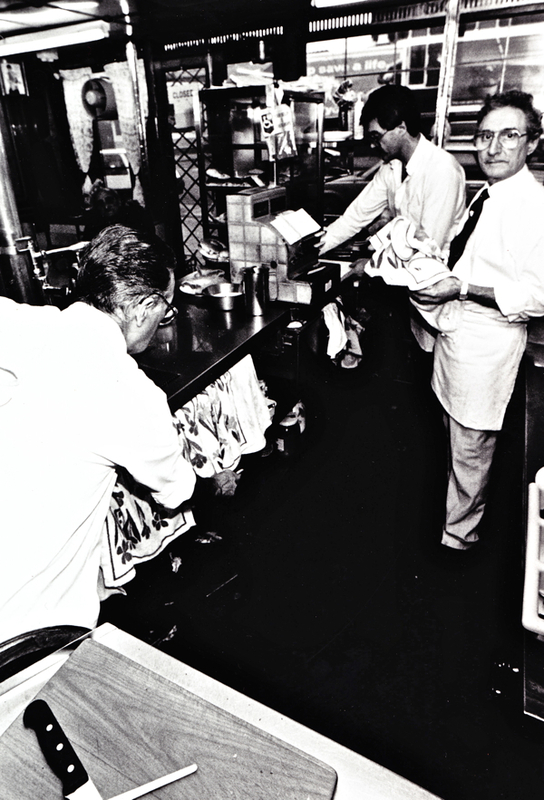 Elide is the E.Pellicci whose initial is still emblazoned in chrome upon the primrose-hued vitroglass fascia and her portrait remains, she and her husband counterbalance each other eternally on either side of the serving hatch in the cafe. In 1921, Nevio senior was born in the front room here. 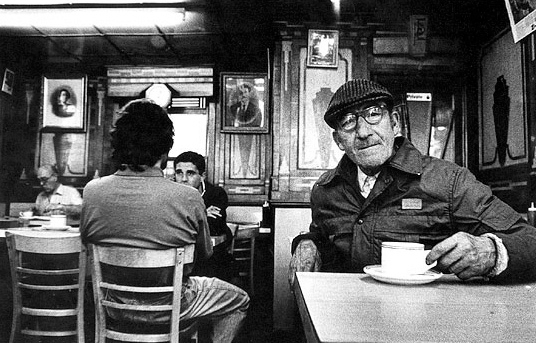 He ran the cafe until his death in 2008, superceded as head of the family business today by his wife Maria who possesses a natural authority and charisma that makes her a worthy successor to Elide. As I sat alone in the quiet of the room, leafing through the albums, surrounded by the walls of press coverage, Maria came upstairs from the kitchen to join me. She pointed out the flat roof at the rear where her former husband Nevio played as a child. “He was very happy here,” she assured me with a tender smile, standing silently and casting her eyes between the two empty rooms – sensing the emotional presence of the crowded family life that once filled in this space that is now a modest store room and an office. Maria and Nevio brought up their children in a terraced house around the corner in Derbyshire St, and these days Toni goes round each morning early to pick her up from there, before they start work around six at the cafe she runs with her son Nevio and daughter Anna. 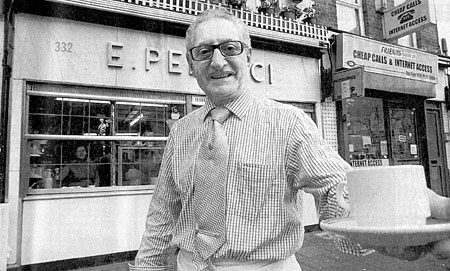 Pellicci’s collection tells a very particular history of the twentieth century and beyond – of immigration, of wars, of coronations and gangsters too. But, more than this, it is a history of wonderful meals, a history of very hard work, a history of great family pride, and a history of happiness and love. 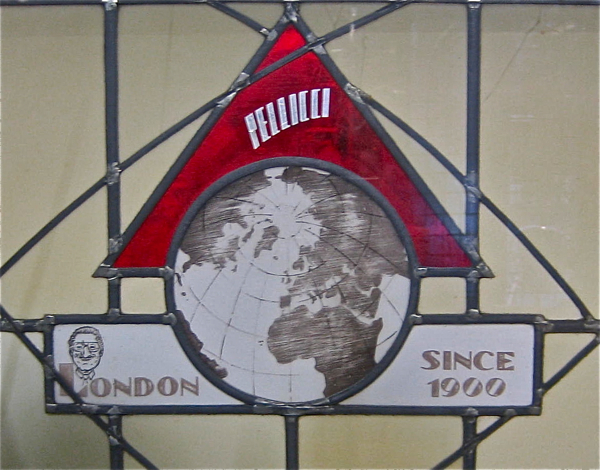 Primo Pellicci still presides upon the cafe where he started work in 1900. 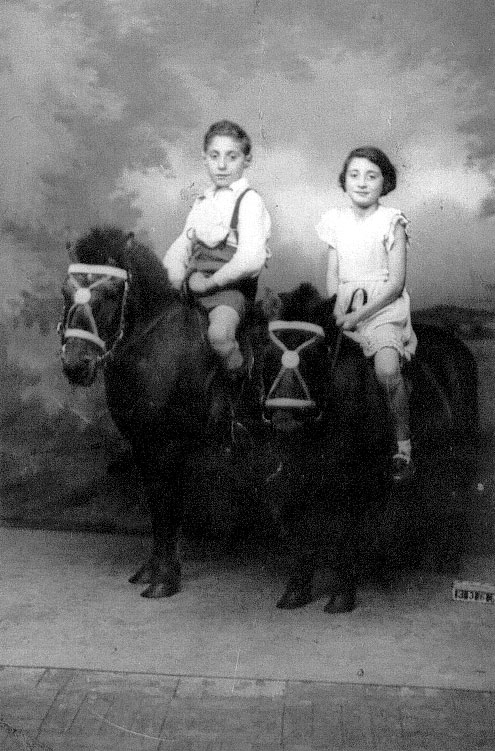 Primo’s children, Nevio and Mary Pellicci, 1930. 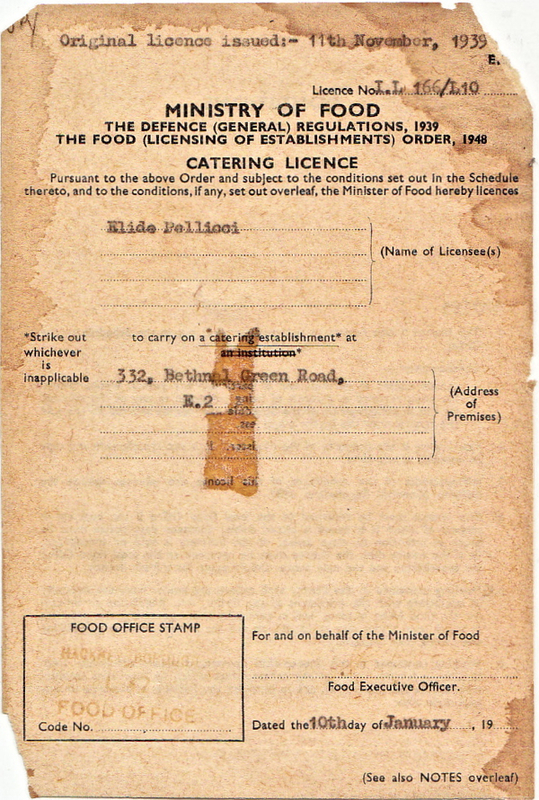 Pellicci’s wartime licence issued to Elide Pellicci in 1939 by the Ministry of Food. 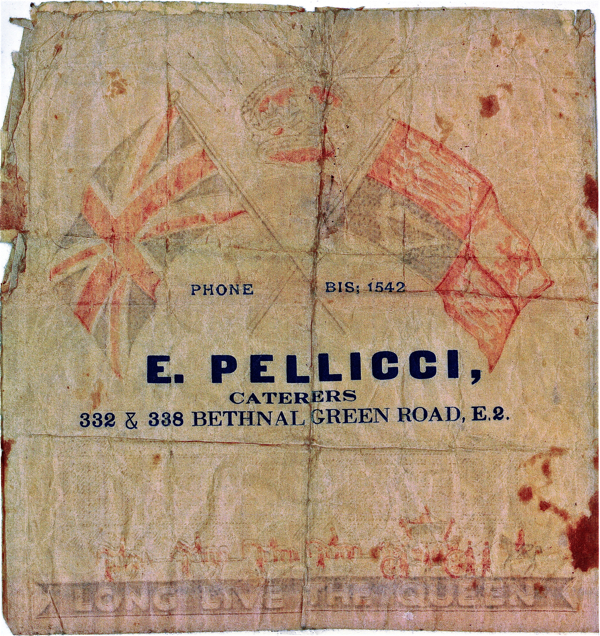 Pellicci’s paper bag issued to celebrate the Coronation of Elizabeth II in 1953 – note the phone number, Bishopsgate 1542. 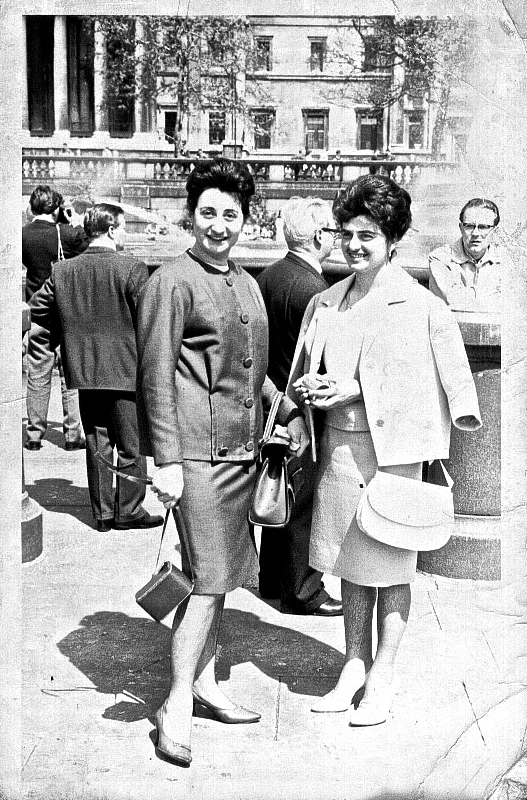 Mary and Maria Pellicci, Trafalgar Sq, 1963. 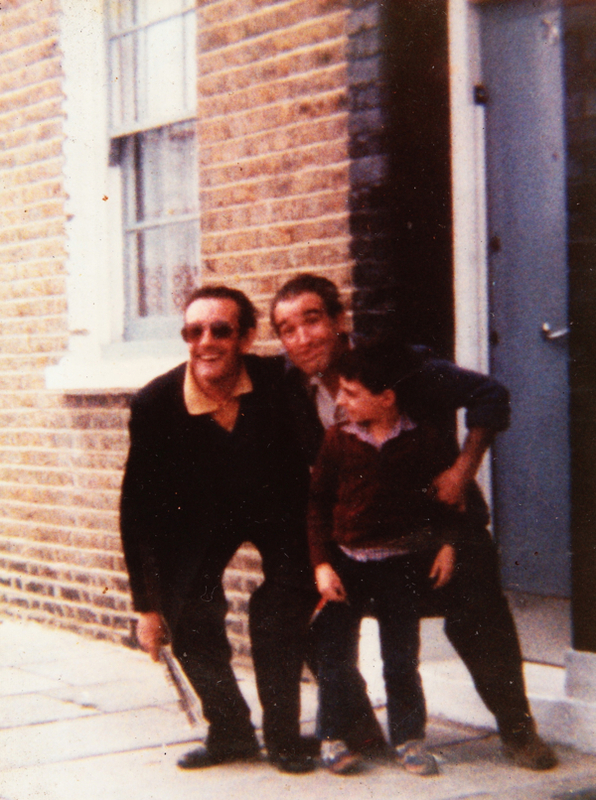 Nevio junior, aged seven, skylarking outside the house in Derbyshire St with pals Claudio and Alfie. 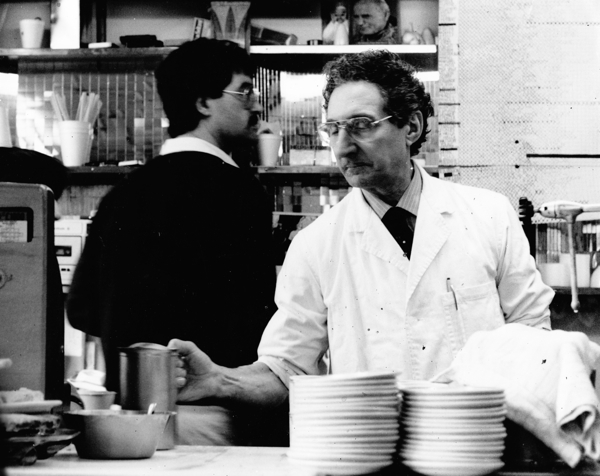 Nevio senior and Toni, 1980. 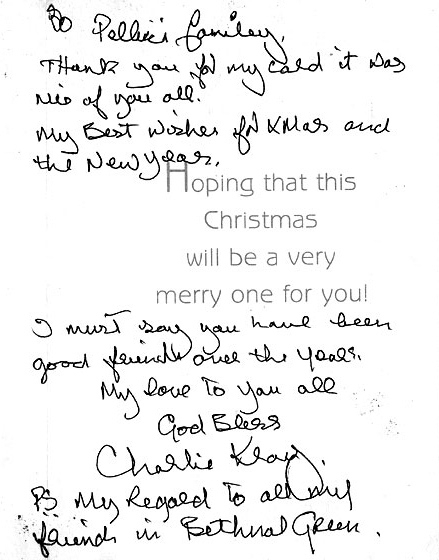 Christmas card from Charlie Kray, 1980. 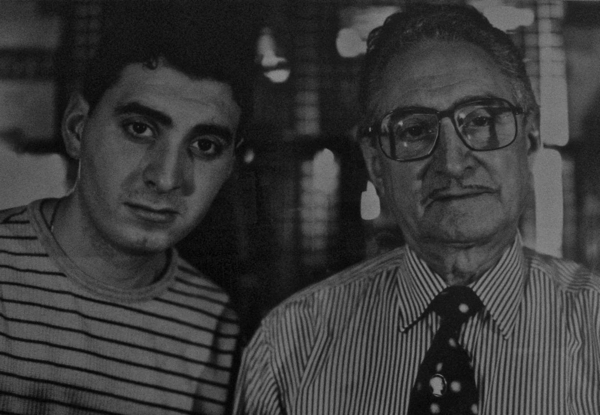 Nevio junior and Nevio senior. 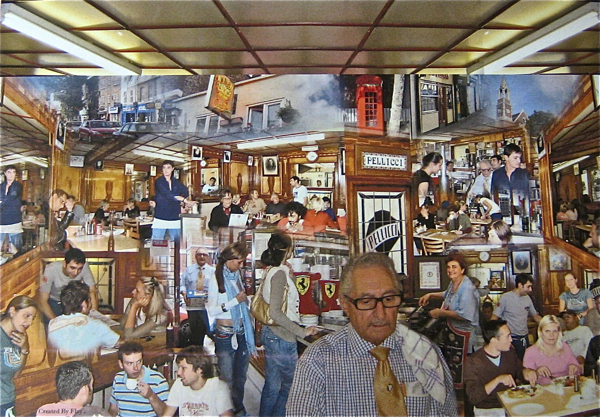 George Flay’s montage of the world of Pellicci’s. 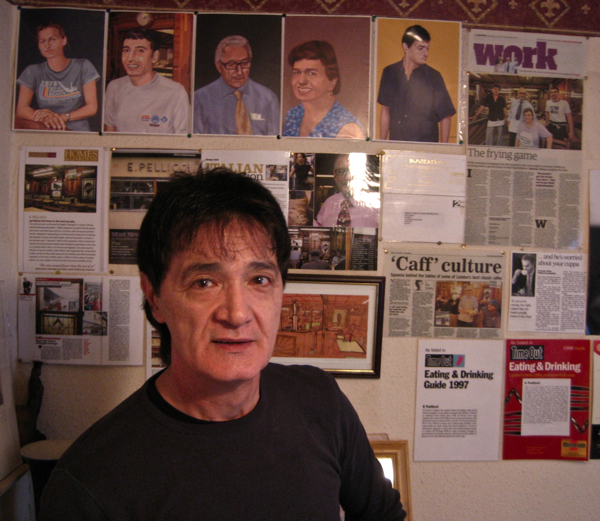 Salvatore Zaccaria, known as Toni, keeper of Pellicci’s collection. So I’m sitting in Pellecci’s one morning and the door crashes open and a man storms in and stabs a finger at the guy behind the counter. “Nevio Pellicci you destroyed my family!” he thunders. There is a shocked silence in the cafe. Then Nevio and the guy both piss themselves laughing. Had a meal with my two sons this Saturday. 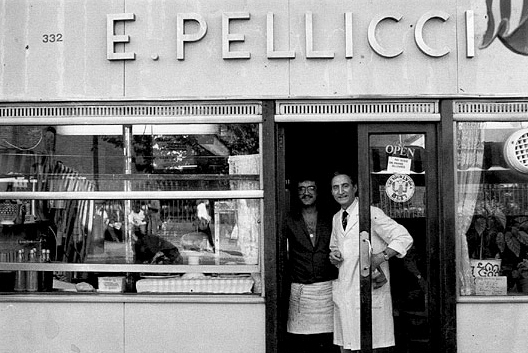 Went to Pellicci’s because my Mum went there when she was a child and lived in Weaver house Bethnal Green. My Mum (maiden name Haslett)is now 97. 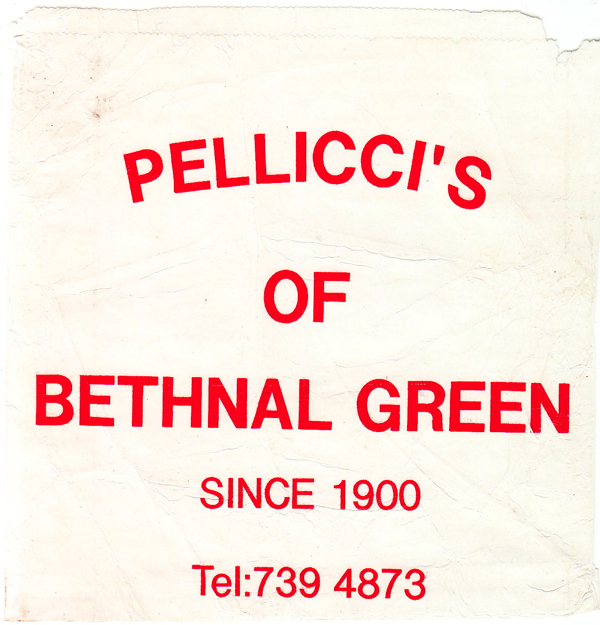 My Mum’s grandma (Evans)sold fruit and vegetables in Bethnal Green very close to Pellicci’s. Had a lovely time and met both Salvatore and Maria.